A sorgum farmer in Kenya celebrating a good harvest. Kenya has in recent years had its share of climate-related impacts. Prolonged droughts, frost in some of the productive agricultural areas, hailstorms, extreme flooding, receding lake levels, and the drying of rivers and other wetlands among other events have lead to large economic losses and have adversely impacted food security. Mbeere in Embu County, Kenya, is no exception. The area has not received adequate rainfall in the last four seasons, leading to poor harvests, dead livestock and an increasingly fragile environment. The long rains, usually the main agricultural season, have become increasingly unreliable due to rainfall decline and increased rainfall variability. The negative impacts of these changes has been reinforced by the destruction of vegetation through the overuse of pasture and unsustainable charcoal burning practices. Presently, significant levels of food aid are being provided to communities in the area by the government and donors, both local and international. It is against this backdrop that Christian Aid – Kenya, has since April 2011 has worked with over 2,000 poor and marginalised farming households. This report* presents the findings of a snap check on Christian Aid's Climate impact of Sustainable Agricultural Livelihoods Innovations (SALI) project sites in Mbeere, Embu County. Its objective is to show why Christian Aid is promoting drought resistant crops in this arid area of Kenya. *Download the full text from right-hand column. Methods, results, key messages and recommendations are provided in brief below. Food Security: Sensitise farmers on the importance of small grains such as sorghum as an alternative to maize production, the productivity of which is declining due to an increasing frequency of droughts. The focus here is to both strengthen food production systems and to aid household incomes through generating surplus crops for market. Access to Markets: Implement market based solutions that increase food security and income generation through increased productivity and capacity. This implies that communities are not only trained in good agricultural practises, but they are also linked to markets for their surplus. This work will focus on strengthening community marketing structures, for instance capacity development in farmer groups and associations to enhance their bargaining power with various actors in the value chain. Access and use of climate information by use of SMS: Develop a more comprehensive plan for developing Climate Information Services (CIS) for farmers. This will ensure there is a more targeted and more effective communication framework suitable for farmers and tailored towards specific crops production, such as sorghum. Access to finance: Source appropriate and affordable financial products for the various chain actors and farmers through engaging various financial services providers, particularly aimed at the development of the sorghum value chain. Access to extension services and inputs: Support access of farmers to affordable inputs and training on best practice, such as the right seed to use, time of planting, weeding and harvesting, post-harvest management, record keeping at farm level and benefits of composting etc. Farmers will be informed on what technologies are available and will also be supported to access inputs like improved seed. Drought resistant and key to food security in the arid and semi-arid lands that cover almost two-thirds of Kenya. In the face of climate change, they are seen as increasingly important in enhancing the resilience of food systems. Grown by poor farmers who live in marginal areas, so increasing their marketability may help with poverty eradication. 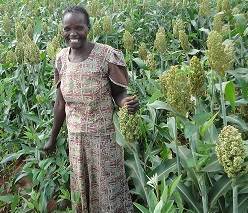 Yields are low, with significant room to increase them: Sorghum yields are only 50% of the regional average, with improved varieties and better husbandry, millet yields can be tripled (from 0.5–1 tons/hectare [t/ha] to 3–5 t/ha). Sorghum, millet and green grams are nutritious food crops rich in proteins, carbohydrates and other essential minerals. They are also affordable compared to other foods. The data was collected through interviews, key informants and focus group discussions. The sample size was a very small fraction of the total number of farmers; notably 54 sorghum farmers, 46 millet farmers and 77 green gram farmers. The data sample was evenly distributed in the project area but this was not done in any scientific way. Rather the samples represented the 3 project zones of the SALI project. The assumptions taken were that the size of the sample will not affect the outcome and this should still give a holistic picture of the status of the above variables. Method 1: Baseline survey and Monitoring Framework. A baseline survey was organised and carried out to collect data on parameters that will be measured later to ensure the project has been successful. The main information needed was: number of farmers, crops grown, willingness to diversify to sorghum and other drought resistant crops, yields, access to inputs and markets and access to timely climate information services. Method 2: Evidence-based scale up of drought resistance crops. Data was also gathered through working with a group of voluteer farmers as a pilot using demonstration plots. The selected farmers were supported to grow sorghum, millet and green grams using good quality seed, improved agricultural practices (including intercropping and water harvesting) and use some weather information in their decision-making. This activity also supported the farmers to reduce post-harvest losses by adopting good storage facilities to store grains, aiding both food security and the storage of surplus produce for marketing. Other farmers were invited to attend trainings for learning purposes. The kind of seed to plant and the time of planting so as to utilize the best of the rainy season. The manner in which to prepare the land and manage any anticipated adverse weather effects. Disaster risk - it informs people to prepare for emergencies from the weather. The best period to carry out some operations, e.g. spraying when it is not rainy for the effective use of pesticides. Production: The survey found that sorghum, millet and green grams are producing 100-300 Kg/acre on average, against an expected capacity in excess of 700-800 Kg/acre. Most farmers preferred production of green grams compared to sorghum and millet due to its higher productivity per acre. The survey also found that “gaddam” sorghum seed developed for the Mbeere region is growing much faster than “Silla” sorghum from Kenya Seed Company. Gross margin analysis: In the farms surveyed, and despite poor weather conditions during the growing season, sorghum, green grams and millet all had positive gross margins [Gross Margin = (Revenue –Costs)/Revenue], indicating that they are profitable crops and have lot of potential if better conditions prevail. The gross margin was higher when the farmers sell their produced as a group as opposed to selling individually, as the association had greater bulk and thus higher bargaining power. Small grains prices compared well with the average prices of the main food crops in Kenya i.e. maize and beans. Storage: Farmers had rudimentary storage facilities, with no well-developed warehousing. This inhibiting opportunities to add value to the crop, since produce can sell at better prices after some months, when in shorter supply. Production costs & fertilizer use: The main cost for small grain crops is the purchase of seeds. The use of fertiliser added to the cost of production but appeared to increase yields by almost double. Farmers also said that they are now practicing crop rotation in order to allow the soil time to rejuvenate. Access to climate information: Most farmers in the project indicated that they have been given the opportunity to access climate information and reported that this was timely (delivered within one day). The current SMS set-up allows farmers to give feedback through replying to the project manager via the SMS system. The farmers enjoy seasonal, monthly, fortnightly, weekly forecasts depending on weather severity and activity on the farms. However, obtaining feedback from the farmers, be it confirmation of information receipt or the usefulness of the information, has been a challenge. For production of small gains to improve, it is important to carry out holistic training of farmers on good agricultural practises using sorghum, millet and green grams, including conservation farming techniques. This would also provide a platform for testing and demonstrating the now famous “Gaddam” sorghum hybrid seed that has proven to be the best in the region. Proper storage and farmer participation in marketing associations are key to gaining the best prices for produce, since the best prices are achieved months after the harvest season and collectively associations have the volumes of produce, and therefore a stronger voice, to shift power from price acceptors to price controllers. The climate information is currently largely one way in Mbeere. The farmers said they will appreciate getting an opportunity to have interactive conversation and ask specific questions regarding diseases, soil fertility etc. To ensure the sustainability of these interventions farmers will need to be trained to continue operating the climate information service system when donors exit. This can only be done if farmers are well organised into marketing groups and these groups each contribute a small fee to maintain the system for climate information dissemination. This is one reason why this study has dwelt on the marketing aspect of these drought resistant crops, as money becomes an incentive for them to grow more of these crops. Increasing diversity of diets is good for national food security. Just three commodity crops—rice, maize, and wheat—provide 60 percent of the plant-derived calories eaten. The heavy reliance on so few foods inceases exposure to crop failures due to disease, drought, floods, and other catastrophes that could be driven or exacerbated by climate change. Small grains are not mainstream commercial value chains, hence they also provide an opportunity for women and youth to participate and earn equitable incomes. Promoting traditional grains could be important for reducing regional agriculture water intensity, wince these grains are adapted to grow on marginal lands without irrigation, pesticides, or fertilizers. They are thus arguably more sustainable and resilient than most modern commodity crops. More work can be done to support communities to survive the scorge of climate change. The poor rural communities in this part of Kenya have land as a resource but might not have the knowledge on how to maximise its use without incurring negative effects to the environment. In my experience trainings alone will not help; some practical work around what they can plant to ensure they have enough food, and on where and how they can best market the surplus to increase household incomes is needed.